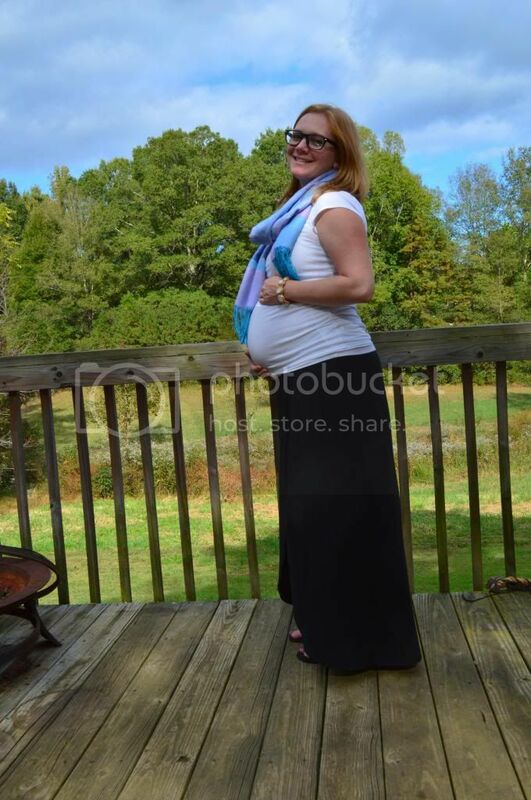 Maternity Clothes: Loving them. Found a great maternity sweater for $2 at the thrift store last Thursday. Movement: I literally feel our baby boy all. day. long. And I love it! Sleep: Sleeping well, but I am a living heater in the bedroom! I am sleeping with no blankets on and the fan blowing on me - my poor husband is shivering! I can't help it. Missing: My brother. Mom and dad are here this week and it has been oh-so-special. I just wish Brother Bear were here to make it complete. I am such a family person and my brother is my bff. Loving: Salads. I typically would not put ranch on them, but I'm loving ranch and croutons! Loving that my mother inlaw hung onto a lot of my husband's baby things so we can use them for our boy and incorporate them into his nursery. Craving: Celery with peanut butter, Macintosh apples, squash - mom made some Weds night for dinner and brought me 4 from home - now all I can think about is squash. So yummy! Feeling: Great! Still running and staying energized. Definitely slowing down my runs as I'm starting to feel a little wear and tear on my body when I go too far or too hard. I'm realizing that my post-pregnancy body will not be able to function properly if I don't take care of my pregnancy body right now. So, I've decided to start using the elliptical and walking when necessary. Looking Forward: To going home for Thanksgiving. Now that I've seen my parents, I'm even more excited about seeing the rest of them when I go home. Also my best friend from high school and my mom are throwing me a shower while I'm home so I'm really excited for that. Best Moment(s): Watching my mom and dad hear baby boy's heartbeat for the first time. That was mom's birthday present! I rented a heart monitor from Baby Beat for my mom's birthday present and it was the best idea I could have come up with! I video taped her reaction as she opened it, but promised I wouldn't share the video. I also got to spend the night with my parents Tuesday night and took the day off Wednesday so we could just hang out and be a family. It was totally worth a vacation day. Mom made the most delish meal Wednesday night: squash, mashed potatoes, and pork tenderloin. Went for a nice 3 mile walk this week and walked several more miles throughout the week. Taking care of my body and not pushing myself too far physically. A few of my favorite former students (I have lots of favorites) send me special pictures from spirit week each year now that they are in high school. I teach some awesome kids. Feeling baby move is my absolute favorite!! I can't believe you're already 28 weeks! Yay for feeling Baby G moving! I love the idea for your mom too! So sweet! love feeling baby move! and that squash your mom made looks AMAZE!! Lookin good lady! Glad you are still feeling good too! I can't believe we are already in the third trimester!!! !